Grab your audience's attention more effectively, and enjoy increased engagement with visuallly appealing, interactive SMS landing pages. What is an SMS Landing Page? Sending traditional SMS is a great way to send customers a simple message quickly and with no frills. But pictures speak a thousand words, and that's where RCS and SMS Landing Pages come in. Esendex’s new rich message builder, Messaging Studio, enables you to design and send mobile landing pages which put the user experience on a mobile first, rather than secondary to desktop. By using images, offer codes and call-to-action buttons you'll be able to drive customer engagement, and increase your process conversions. What can SMS Landing Pages be used for? Here are some of the ways your business can send richer, more visually appealing content to your customers. Retailers can stay ahead of the competition, reduce costs, and increase sale conversions by sending offers and promotions directly to customers' mobile devices. SMS Landing Pages can help with this by providing the branding and imagery you would expect to see on a traditional webpage, but, critically, offering a more streamlined shopping experience. Financial service providers can replace any paper based communication with a personalised, mobile focused SMS Landing Page, which will reduce their cost to serve and increase customer engagement. Traditionally plain customer communications like statements and alerts can also be presented in a more visually appealing way to increase the engagement level with the customer. Rich appointment reminders, including maps and branch pictures. Healthcare providers can ensure that important communications like appointment reminders reach their destination and are understood, without the need to rely on slow and unreliable postal mail. Providers will benefit from the inclusion of "Save to Calendar", "Call Us" and interactive map buttons, which aid the patient's journey and reduce no-shows. Providers are also able to make substantial cost savings by switching from a paper-based strategy, to a digital strategy employing SMS Landing Pages. Increase your conversions with image-rich communications. Make it easier for agencies to alert potential buyers to their perfect property, without the need to search on property websites. Estate agencies will be also be able to reduce the amount of time that their agents need to spend calling potential buyers by sending richer communications which promote self-service. Utility providers can save money by switching from a paper based communication strategy, to a digital strategy which employs SMS Landing Pages. Communications can also be tracked and reported on, meaning that providers can say with certainty that important communications have reached their customers. What you can do and what you'll achieve with landing pages. Include images, CTA buttons and full company branding. Fully trackable links to monitor the success of your campaign. Include dynamic fields such as name and purchase history. 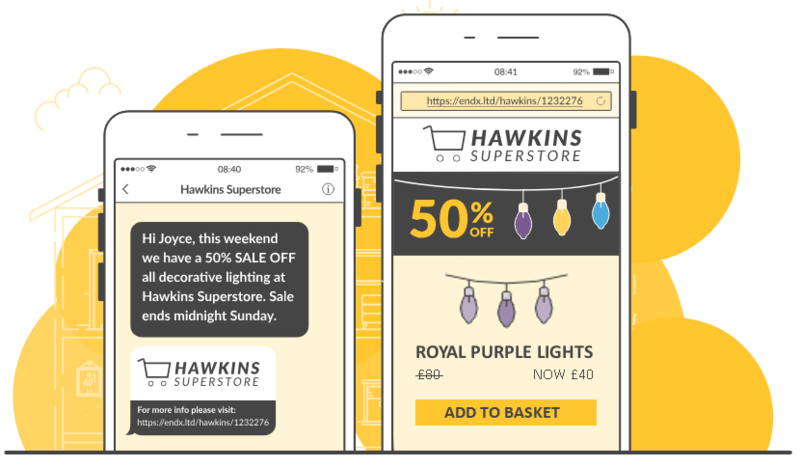 Encourages conversions from mobile users with a friction-free process. Integrate landing pages into your existing communications strategy. A simple to use landing page creator opens this feature up to everyone. Reusuable templates from professional designers to help you get started. When sending RCS campaigns, employ SMS Landing Pages as a backup when contacting non-Android users. If you're worried about how you'll build rich message communications for your customers to enjoy - you really don't have to be. Our simple to use message building environment, Messaging Studio, will allow you to build highly engaging, visually attractive messages with just a few clicks. SMS Landing Pages are also just the start of what you can acheive with Messaging Studio. Set up an SMS Landing page up as a fallback for an alternative channel, or choose to send customers richer communications by using alternative channels including RCS and WhatsApp. Studio will also give you the power to future-proof your communication campaigns, with new channels added to it as they come online. What are the benefits of SMS Landing Pages? Include images, call to action button and personalised content. Switching from a postal communication strategy will allow budget to be spent in other areas. More visually appealing communications will increase the chances of customers reading and engaging with your message. Use your company’s colours, logos and images to create a familiar environment for customer interactions. Remove the distractions of traditional webpages and offer a more streamlined route to conversion. See where your campaigns are succeeding/failing and quickly make the changes required. Here's an example of how partnering with Esendex can benefit your customers. Four Star Pizza were keen to try something a bit different for their latest Black Friday promotional campaign. After speaking with Esendex, they created an SMS Landing Page communication strategy which resulted in a 30% increase in conversion rates, when compared to their previous standard SMS campaign. Want to learn more about SMS Landing Pages?